You know it is always fun experience to have test run. Especially those that require you to lay in a position that hurts really bad and shove your oversize body in a slightly bigger tube. I kid I kid. 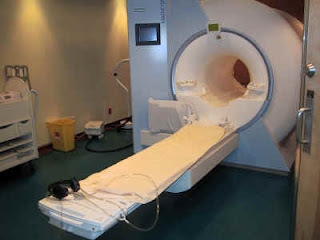 This is like the gazillionth MRI I have had done but this is the first one that I have ever had to go into the tube. For the most part they have been on my knee so I only had to go waist deep. It was actually a pretty cool thing. I was a little worried when I saw the hole that I had to squeeze through but the tech assured me that I would fit. I think my nose was about 2 inches from the top. Anyway, I was hurting pretty good once the test was over. I had been in the car for a while, then back to the car for another hour or so. I got home in time to do an afternoon run. It was a 3 miler this week and I ran a little faster than I have in a while. About mile 2 my legs were really starting to hurt. Mile 3 I was so ready for it to be over. And since then I have been in a steady stream of pain. I am hoping to have a little bit of hot tub time today without any pool time. I get the result on Monday and I don't really even know what to expect at this point. I just want to stop hurting. I hope to get in a workout tonight but I will only get one today. Well, one and a soak in the hot tub!!!! I hate confined spaces, I hope your MRI results give you an insight into the pain. Good on you for pushing through the pain and doing a workout on top! AWESOME! I've Done Nothing but Work Today! My Running Buddy is On CRACK!!! !